These high quality stainless steel garden tools benefit from an ergonomic handle. The design of these tools makes them ideal for use by all gardeners irrespective of age or ability. An optional arm support cuff is available for those with conditions that significantly reduce grip strength. The illustration demonstrates the benefits of the ergonomic handle. 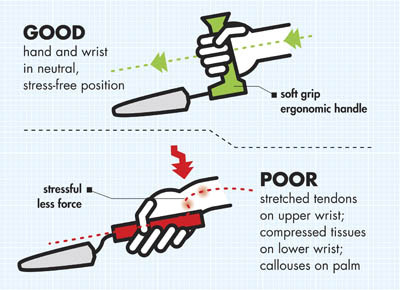 Traditional in-line tools create wrist strain and after prolonged use can cause calluses on the hands.